Fans of Anthony Demetre will be thrilled to learn that the Michelin-starred chef of Arbutus and Wild Honey, and luxury hospitality brand Searcys are behind the newly minted Urban Coterie. 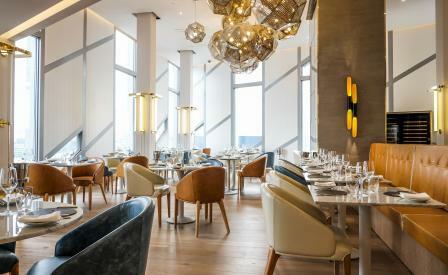 The star-wattage pedigree of the diner is boosted by bright views of central London from its 17th-floor perch in the M by Montcalm Hotel. London-based design studio Tonik Associates have invested the space with hints of Arbutus’ grand bistro vibe and a dash of Art Nouveau by way of trapezoid shaped windows, brass and leather trim, white marble, and low-slung dining chairs clad in light pastel leather. In the kitchen, head chef Martin Zahumensky (ex-Texture and Hibiscus) turns out a brisk, uncomplicated seasonal British menu for Shoreditch’s techie-tribe, suits and start-up moguls. So, the autumn menu features game, rabbit, tripe and oyster mayonnaise, kedgeree and pork belly, but then the hungry eye tends to gravitate towards more unusual offerings like fermented plums, potato doughnuts, polenta chips, pig’s head, and cockles and kale nuzzling grilled monkfish. The autumnal theme is carried over in the Sky Bar where the marquee tipple, appropriately called After a Walk in the Forest, mixes vodka and vermouth with pickled mushrooms and walnut.